Maybe you don’t believe that a groundhog, a large member of the squirrel family also called a woodchuck, can predict if spring will come soon or if winter will remain will stay around six weeks past Feb. 2. The historic background of Groundhog Day, supposedly founded in a European agriculture belief, doesn’t really matter if you loved the Harold Ramis/Danny Rubin movie that came out in 1993. 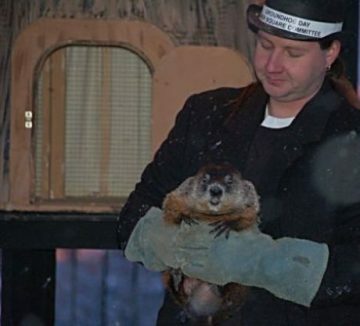 What should motivate you to travel to Woodstock, IL, about an hour northwest of Chicago, is that the town celebrates Groundhog Day every Feb. 2 by reenacting the movie’s prognostication, showing the movie and giving tours of the movie’s Woodstock sites. It’s fun and free. 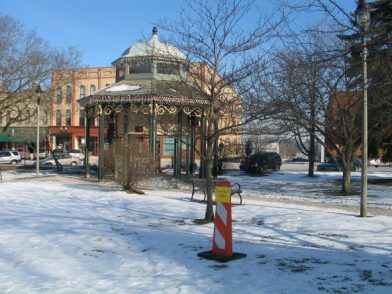 Even though the action supposedly takes place in Punxsutawney, PA with groundhog Punxsutawney Phil, most of the movie was filmed around the picturesque square in Woodstock, a location within commuting distance of Harold Ramis’ north suburban home. The fun begins very early in the morning with groundhog Woodstock Willie taken from his tree-trunk abode. A whispered conference that really depends on if it’s sunny enough for Willie to see his shadow and so scurry back into his hole for six more weeks or cloudy enough for him to stay out because Spring is on the way. So, go see the reenactment at 7 a.m. Feb. 2, the movie at 10 am Feb. 2 or Feb. 3, the walking tour of movie sties at 1L30 Feb. 2, 12:30 Feb. 3. ending with hot cider at the B&B where Bill Murray as TV weatherman Phil Conners, stayed and woke up to the radio alarm every morning, every morning, every morning. The event will feature actor Stephen Tobolwski who ‘Groundhog Day’ fans know as Ned Ryerson. Make the trip easy tby snagging a reservation at , the Cherry Tree Inn, the B&B where Phil Conners stayed. (if filled this year, try for next year), or one of the nearby roadside hotels like the Best Western. For event schedule visit Woodstock Groundhog. For accommodations visit Woodstock where to stay. To see clips from the movie go to YouTubeWatch.